The Concert Band is made up of all wind and percussion students who have successfully completed the first book of the district music series. Generally, this group is for sixth grade instrumentalists; however, older students do participate in this group if they have just begun a new instrument. Students enter this group from their elementary school programs. It is an extension of their prior experience and a precursor to the more advanced Symphonic Band and Wind Ensemble. This group meets once a week during the school day. As a member of this group, students are required to take lessons and perform in at least two concerts a year. The Wind Ensemble is comprised of wind and percussionists in the seventh and eighth grade who have successfully completed membership in the Concert Band or who have displayed the ability to play the required music and scales to be a member of these groups. It is even possible for sixth grade students to be assigned to these groups if they meet the necessary criteria. The Symphonic Band is comprised of mainly seventh grade students with some advanced sixth graders. This ensemble is the transition between Concert Band and Wind Ensemble and oftentimes combines with the Wind Ensemble for performances. Members of these groups are also required to take lessons and participate in a weekly rehearsal that takes place during T & D. They also perform at least two concerts a year, which are required as part of the grading criteria. Small-group ensembles are formed to meet the needs of the more advanced students at Rosa. From year to year the groups will change as the performance levels or instrumentation changes. Since our formation, we have had a Flute Ensemble, Clarinet Choir, Sax Quartets, Percussion Ensemble and Brass Quintet. These ensembles rehearse during lessons and after school, as needed. There are currently 180 wind/percussion and 100 string students enrolled in the Rosa music program. The numbers are a credit to the hard work of the fine elementary school music teachers who inspire the students to play and then continue. It is also a credit to the supportive parents and their encouragement. And a further credit to the students who are willing to put in the time and effort to participate in these programs. Each member of these groups is required to take lessons and attend weekly rehearsals, as well as the occasional after school rehearsal (always notified in advance). As a member of any of these groups, a grade will be given as part of the elective requirements in Cherry Hill. 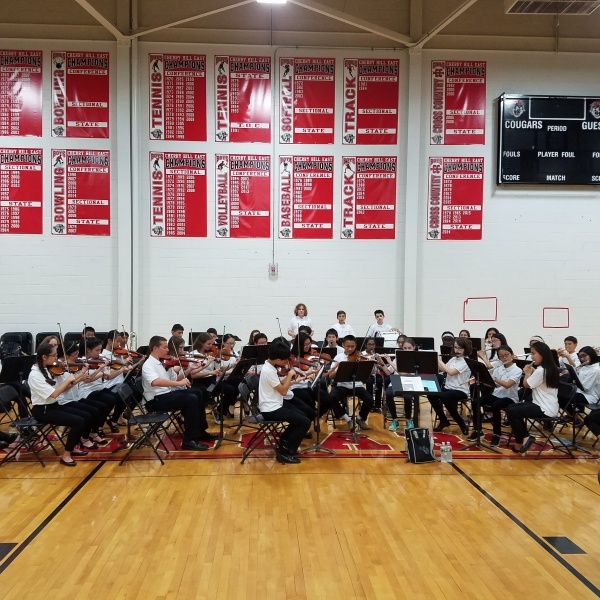 The Rosa Instrumental Program offers a variety of performing opportunities in many different areas in an attempt to accommodate a wide range of musical abilities and instrumentation. Besides the string program, Rosa has four different core instrumental groups - Wind Ensemble, Symphonic Band, Concert Band and Jazz Band (see the link provided for more information), plus a variety of small-group ensembles based on the year-to-year needs of Rosa's instrumentalists.